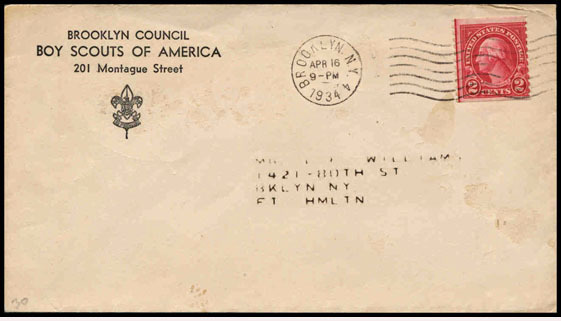 National Headquarters, National Council covers are now listed in Cnc. 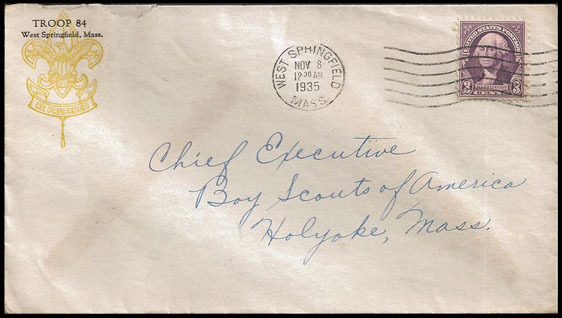 This is the earliest recorded "Boy Scouts of America" cover of any sort. 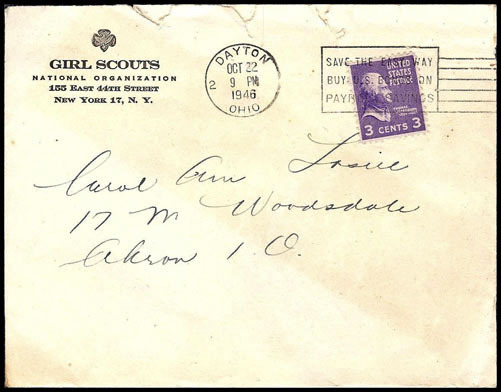 The earliest Girl Scout cover of any sort known to the editors. 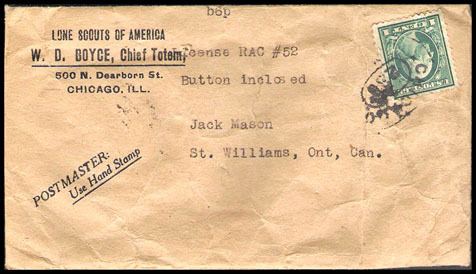 Used to mail a pin back button. 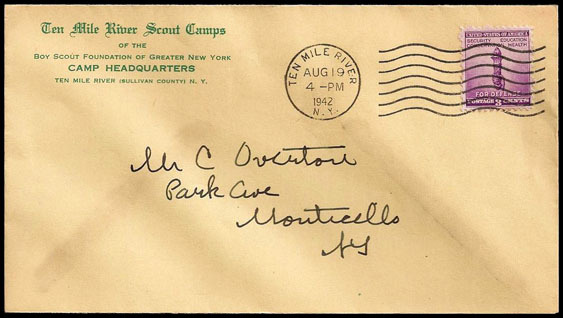 Lake Scout Camps in New York. 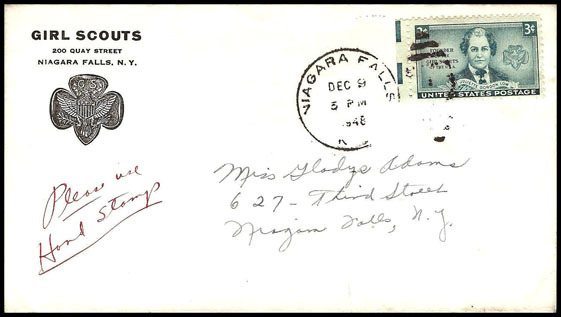 Tuxedo, NY was the post office until 1925. 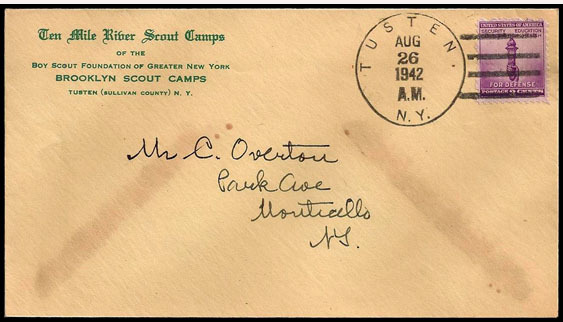 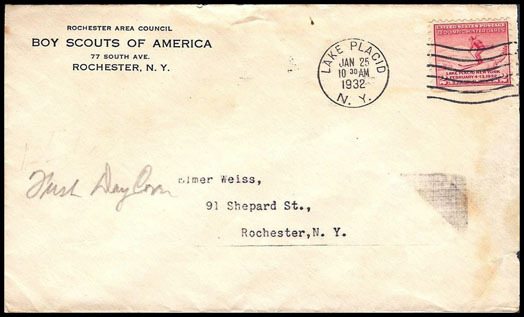 Boy Scouts of Syracuse Camp Loyalty, in Tully, NY, was in use 1913-1929. 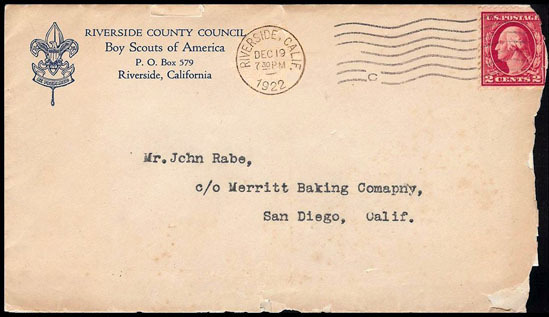 Riverside County Council, Riverside, CA See 32-0.2 & 32-0.3 in the Print Catalog. 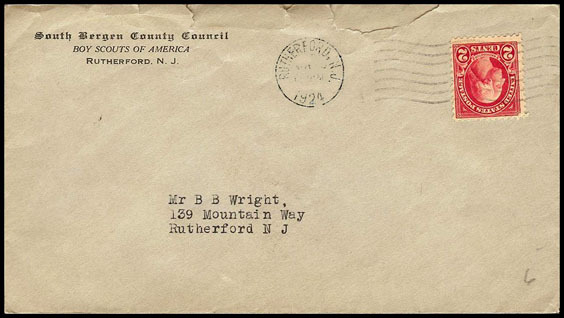 South Bergen County Council, Rutherford, NJ. 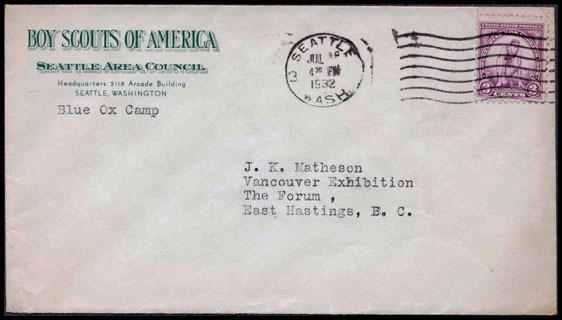 On "Only Air Mail Landing Field in Oregon"
See enclosure in L. Letters & Mailings 1926. 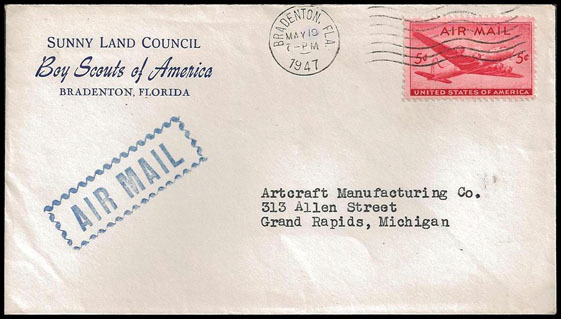 Also, in "Additions", see #32-0.7 in the 1930s decade. 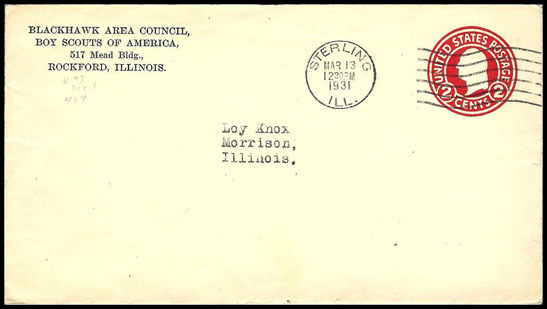 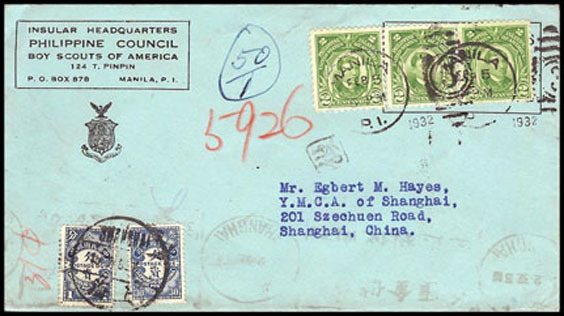 cover from a US territory. 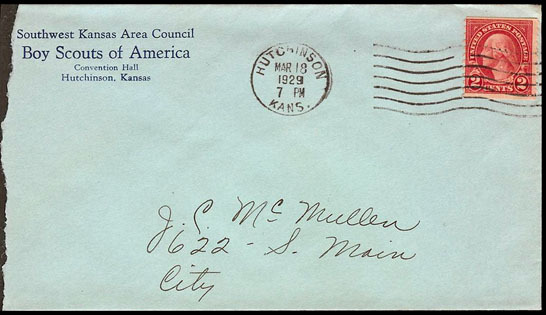 Also, in "Additions", see #33-14.1 in the 1930s decade. 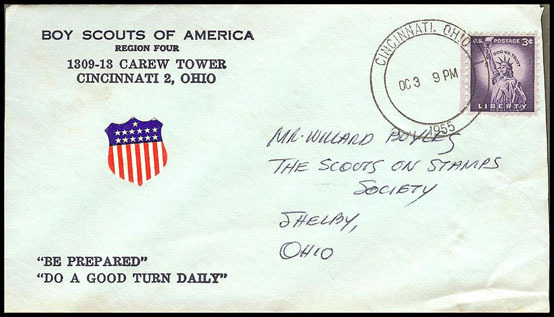 The Blue Ox Scout Camp was on Mercer Island, east of Seattle. 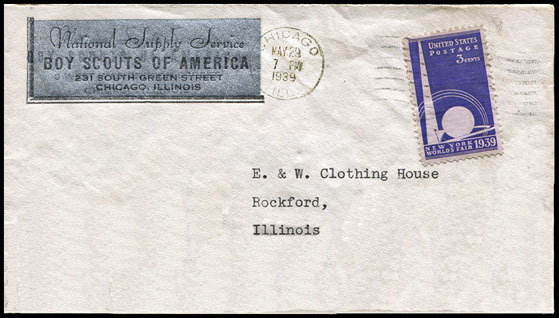 See the 01/05/34 letter in the Letters & Mailing section. 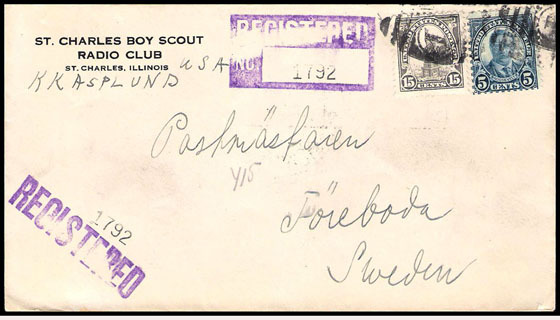 for the first Scoutorama. 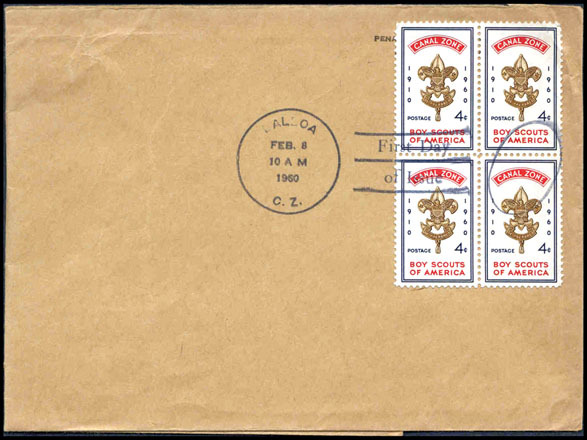 See 36-2.1 in Additions & 36-2, 3, 4 in the Print Catalog. 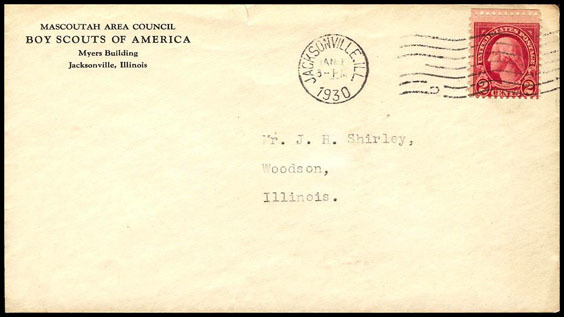 District of Columbia Council, Washington, DC. 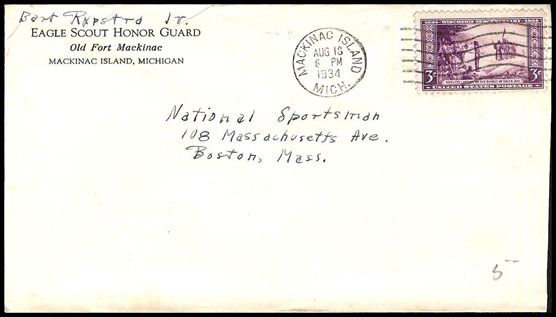 Note address error; "Ann Harbor" for Ann Arbor". 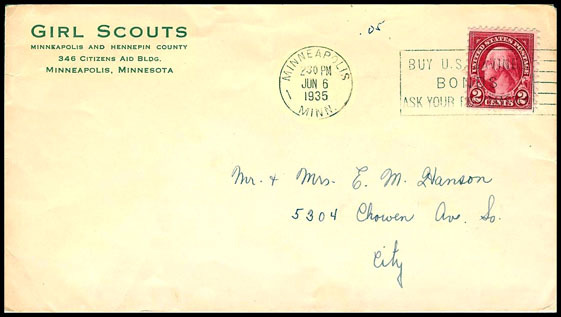 Girl Scouts of Minneapolis and Hennepin County, Minneapolis, MN. 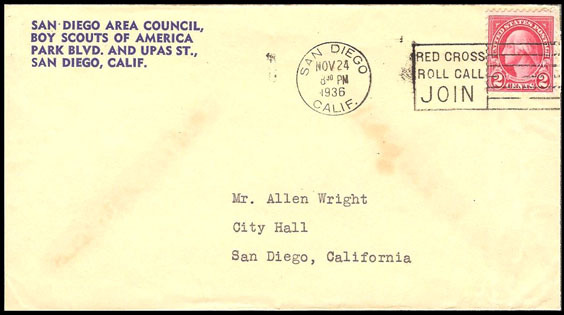 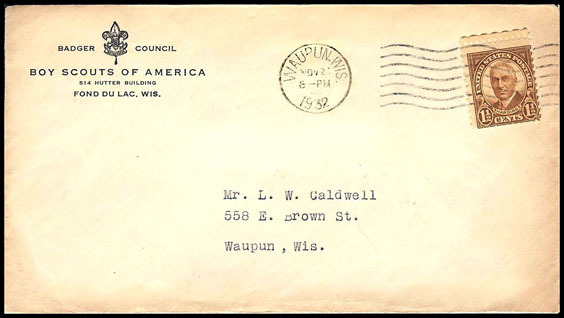 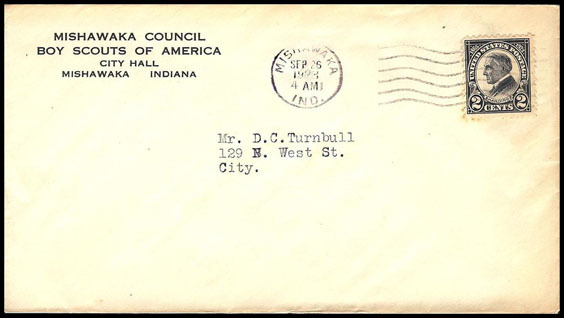 FDC of the "Inauguration of the Commonwealth of the Philippines"
only from 11/15/35 to 10/31/36. 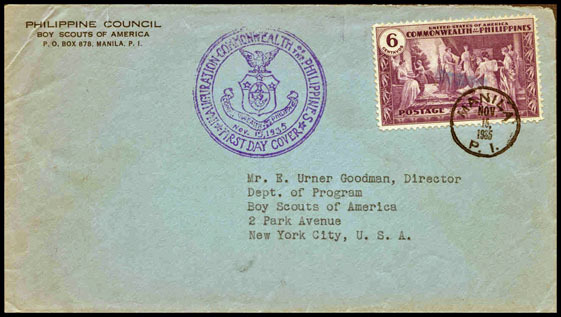 The addressee is E. Urner Goodman, Founder of the Order of the Arrow. 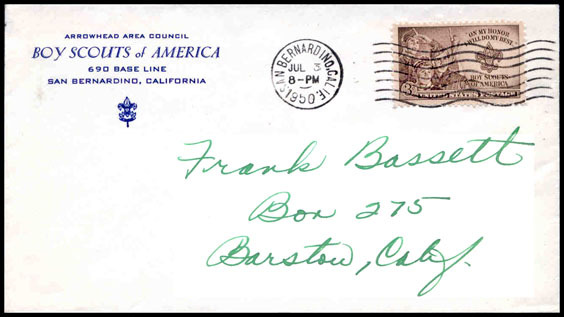 Ref: SOSSI Journal July/August 2008, page 106; March/April, 2009, page 48. 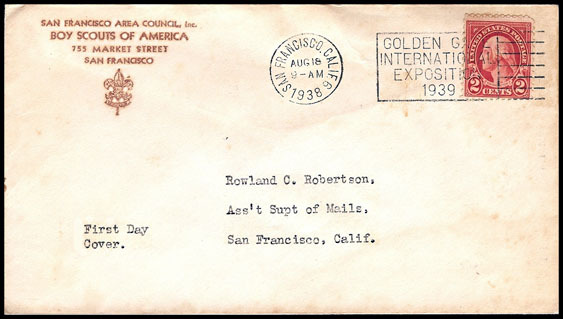 [Possibly] the first day of use of the "Golden Gate International Exposition 1939" machine cancel. 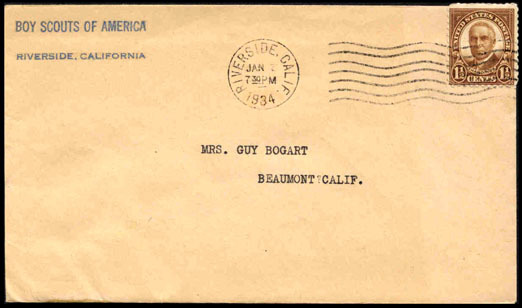 Address correction printed over old address. 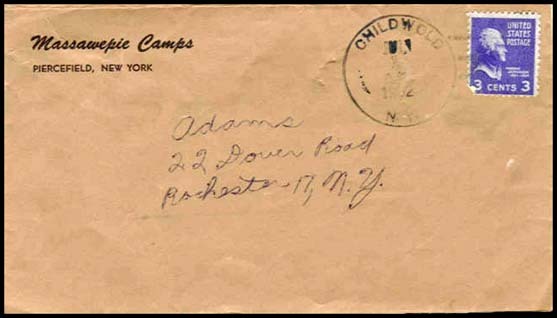 Additions in this Online Catalog for more information about the cancels. 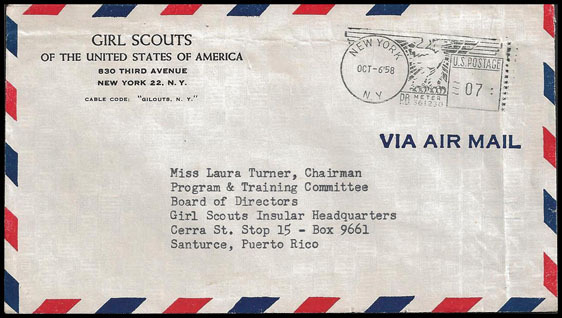 Note that this Tusten cancel is different than the one shown in the Print Catalog from 1953. 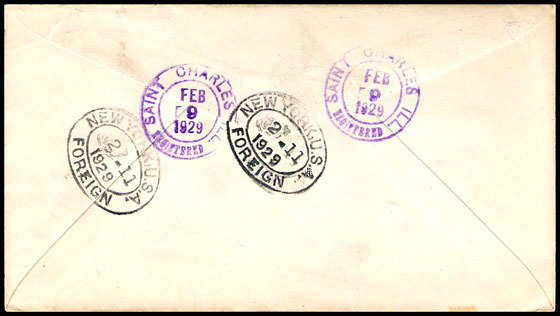 Airmail to Switzerland marked "Return to sender No service available". 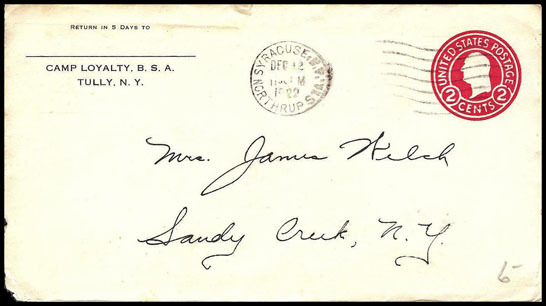 Backstamped 7/7/43 New York, NY. 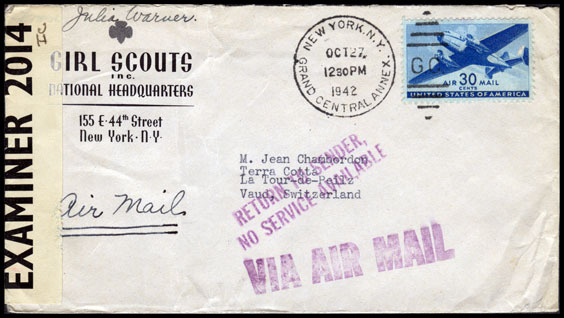 WWII was in progress between NY & Switzerland. 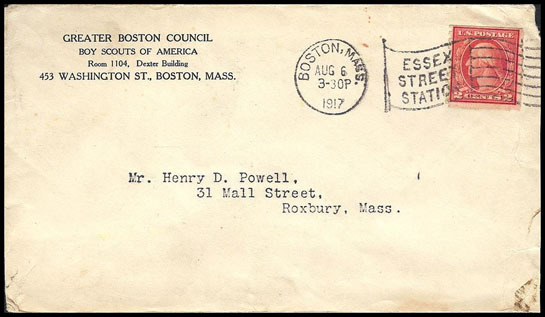 5½ Bar Baronial (Invitation) envelope. 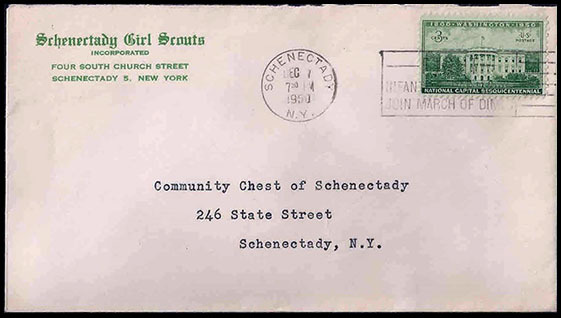 With "Girl Scouts United by Ideals" meter stamp in red. 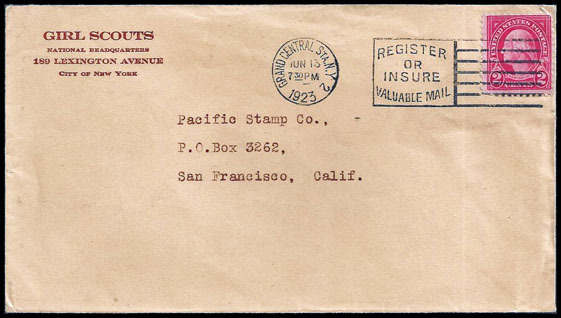 Brown on brown 4⅛" x 10" window invoice envelope. 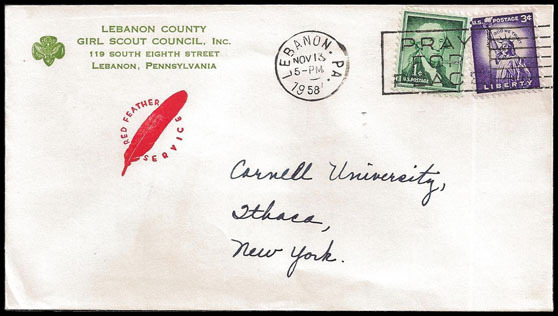 With "Stengthen the Arm of Liberty" meter in Red. 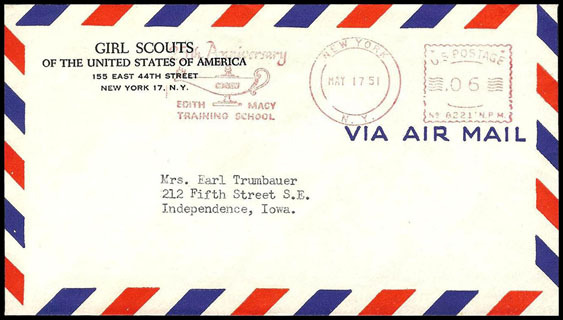 From National Headquarters with "25th Anniversary Edith Macy Training School" Meter in red. 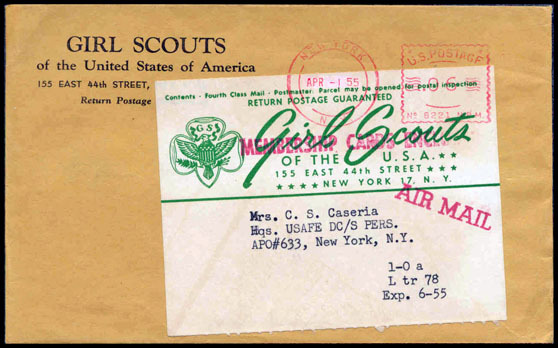 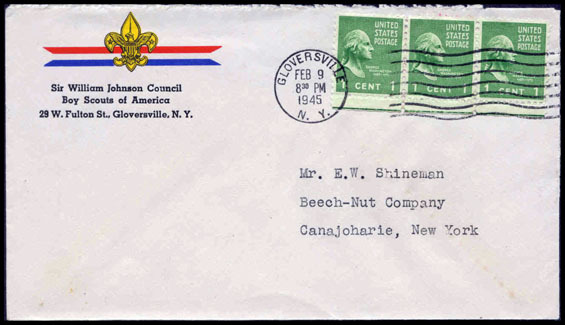 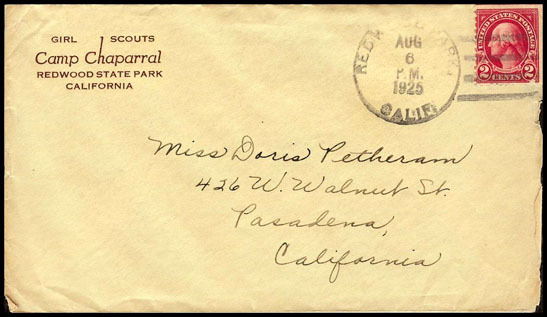 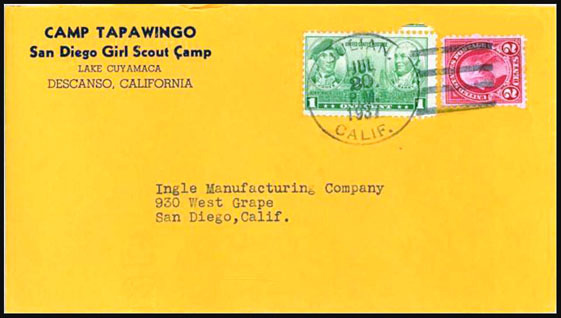 This example contained a Scout's letter home on matching stationery. 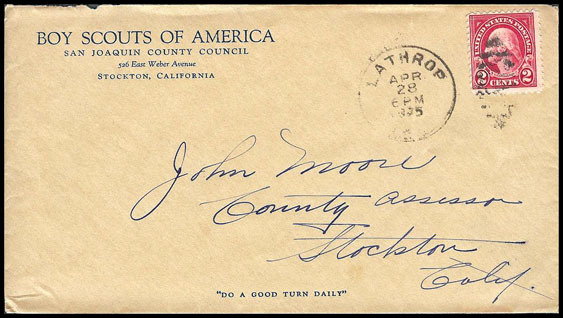 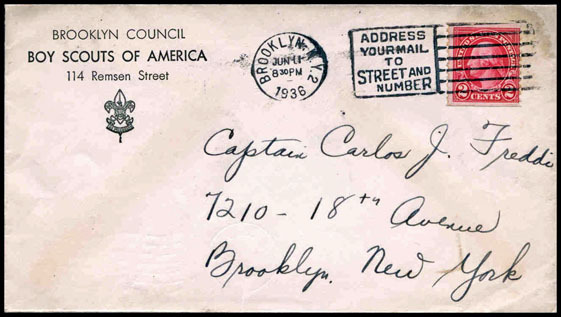 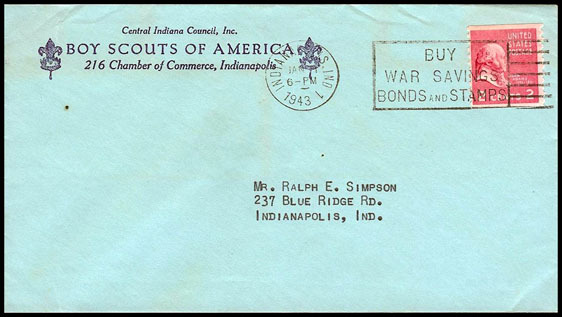 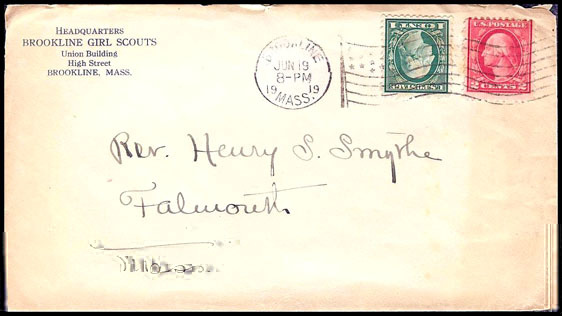 "Additions & Corrections" for the continuation of the Camp's postal History. 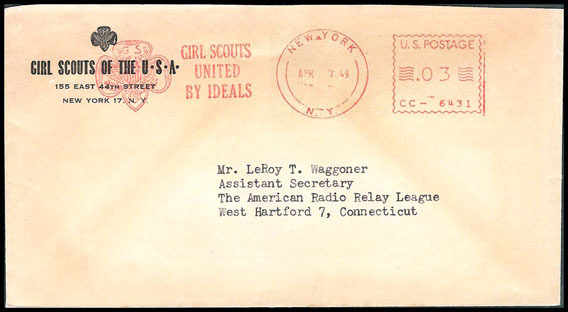 With meter tape promoting the First National Senior Girl Scout Roundup. 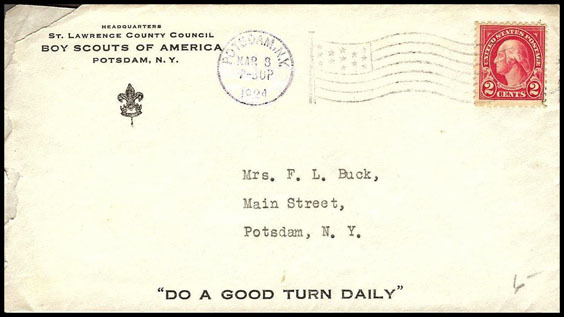 With meter tape promoting the First National Senior Girl Scout Roundup mailed during the Roundup period. 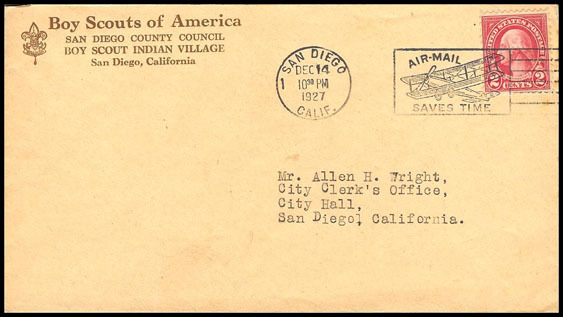 Red Feather Service was a charitable organization similar to United Way. 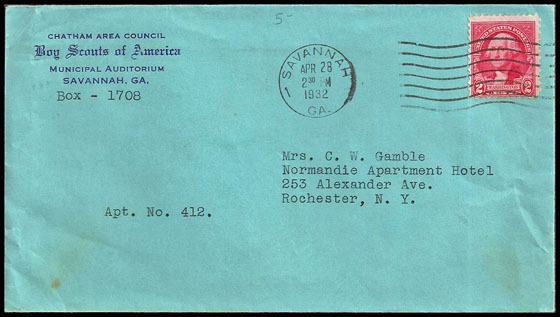 The Council Office relocated at some time between these two dates. 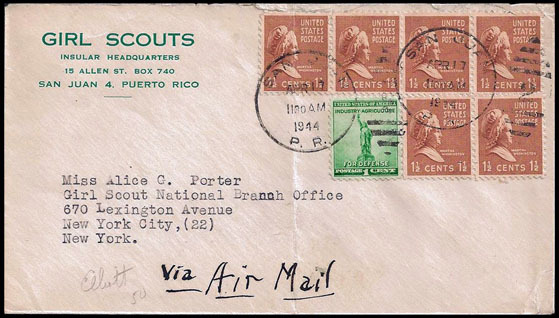 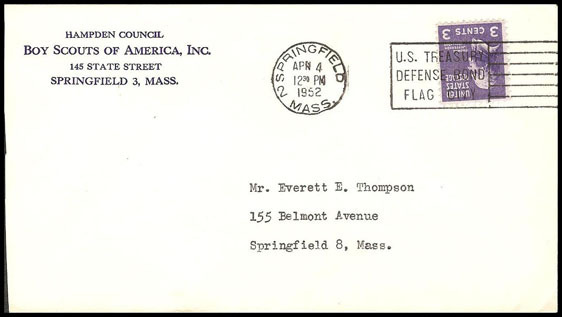 The envelope was used to mail stamps directly from the Philatelic Agency. 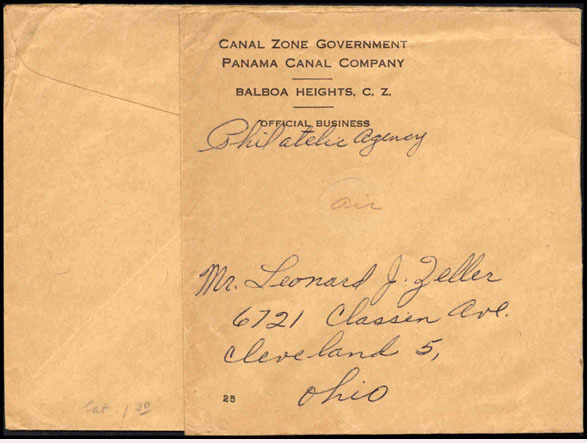 the Panama Canal" & "Panama Canal Zone" are incorrect. 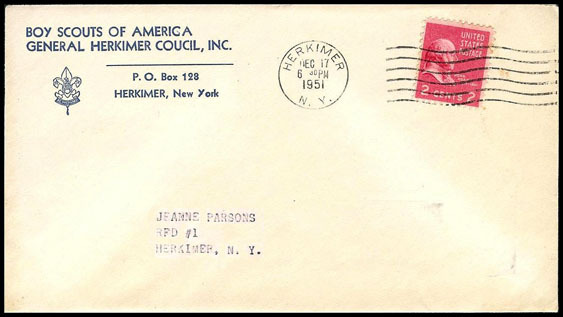 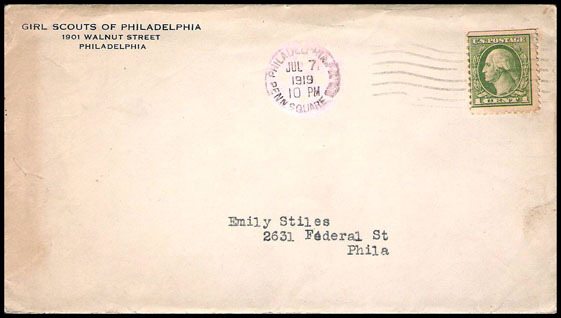 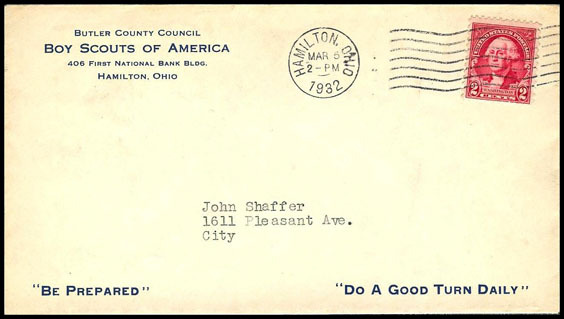 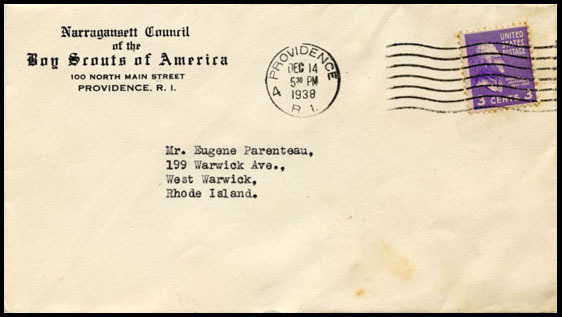 The envelope was used to mail stamps & FDCs directly from the Philatelic Agency.